These galleries primarily showcase miniatures that have been created by and/or are owned by members of MSC. This page highlights members at work and projects, including Fun Days, Unfinished Kit Days, and other special projects. Enjoy and be inspired! Marcy W and Larry W created the door in box kits and coordinated this event. We had to venture outside in the cold and snow to spray seal the wood clapboard siding! But it was warm inside with homemade soup and snacks while we worked. Weller C created the wooden peddler’s cart kits and coordinated this event. For all of us making the same item, the variety is amazing! 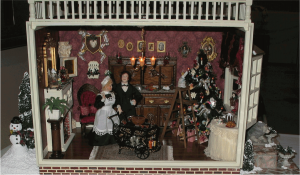 This lovely Victorian Christmas scene was created by nine MSC members in response to a “Creativity Challenge” proposed by Miniature Collector magazine. The magazine invited six miniature clubs to participate. The results were judged by public vote at the prestigious Tom Bishop Chicago Inter­national Show & Sale held in April 2005 in Schaumburg, Illinois. Our “Christmas at Lyonsworth Hall” entry won Second Place. The challenge consisted of turning an unfinished room box and a very odd assortment of ordinary objects into a creative and coherent scene. Each club had about two months to complete it and each received the same 13 objects, which could be painted or added to but not cut or dismantled. Look for the following objects in the photos: gold picture frame, plain fireplace, white half column, crutches, spoon rack, ironing board and iron, picket fence, turkey, ladder, violin, fire hydrant, white wire cart, and bar or counter. Jeanie G graciously guided this committee, partially bribing the team with her tasty desserts. And she meticulously documented progress every step of the way. A Victorian Christmas theme was decided upon when Marcy W commented that the fire hydrant looked like a potential plum pudding (and indeed she made it into one!). Ideas flowed from there… Many items were handmade, including the Victorian Christmas tree and shield hanging by Lois B; custom porcelain dolls, Angelica and Geoffrey, by Carol B; one-of-a-kind sideboard, valance, and lion statue by Ingrid K; custom trolley and dessert table by Marcy W; roombox preparation with electric wiring, fireplace, and roof balustrades by Larry W; needlepoint chair cushions by Jane P; and aged brick exterior, patio, and copper window roof by Jeanie G and Ardy G. Everyone contributed and worked very hard to make this a truly unique and wonderful representation of what our members can accomplish. The story: Lyonsworth Hall has been decorated for a gala holiday party. Servants have set out a roast turkey dinner buffet complete with an assortment of delectable desserts. The beautiful maid, Angelica, is bringing in a trolley laden with fruit punch and beverages. Geoffrey, handsome son of Lord Lyonsworth, has come to surprise Angelica and steal a kiss, and his intentions are most honorable. He playfully holds mistletoe over her head, while his other hand presents a distinctive blue Tiffany box. Romance is in the air on this very special night! Lyonsworth Hall Creative Team: (Front l-r) Marcy W, Lois B, Jane P, (Back l-r) Ingrid K, Ardy G, Bill B, Carol B, Jeanie G. Not shown: Larry W.
The sweet Bear House in the photos below was a project from 2007. Master Craftsman Randy H designed and cut the wooden kits. Sandiey C drew all the colorful graphics and designed the furnishings. The group assembled and donated the houses to a local women’s shelter. The children there loved them! The design was also adapted for our 2015 Youth Workshop. Since 2011 we have sponsored a free summer workshop for children. Typically held in July at the Madeira Branch of The Public Library of Cincinnati and Hamilton County, this one-afternoon event has been extremely popular. Marjorie R, or “Mini Marjorie” as the kids call her, does a fantastic job of planning and presenting the workshop, along with a little help from club members and library staff. Space is limited and reservations fill up within hours of opening the phones. If you may be interested in your child attending, watch for announcements on the Calendar and News pages. Some past projects are shown in the galleries below. These are some of the wonderful creations made by our young attendees at the Youth Workshop in 2018.